Bandon, OR. Last year, the Seattle Team lost the Greenspan Cup on a final hole, ten-foot par putt by Steve Cox. This year, they promptly took it back. Whitaker and Laidlaw, shown here with World Team captain Cheever, combined for 8 1/2 points. Steve Whitaker went 5-0 and Frank McCaslin and Peter Fessler added 4 1/2 and four points respectively as Team 206 routed the World Team 23 1/2 — 12 1/2 at Greenspan Cup XXI in Bandon, Oregon. Leo Madden went 3-1-1 for Captain Greg Cheever’s squad, which lost for the second time in three years and eleventh time overall over the Cup’s twenty-one year history. Despite his struggles here, Madden won 3 1/2 points for the Worlds. The Seattle Team’s glow-in-the-fog coral shirts were the talk of the resort on Saturday. Apparently aware that Bandon has a limited dress code, Waldner, shown here with Stratz, O’Brien and Cheuk. went with the untucked look all weekend. 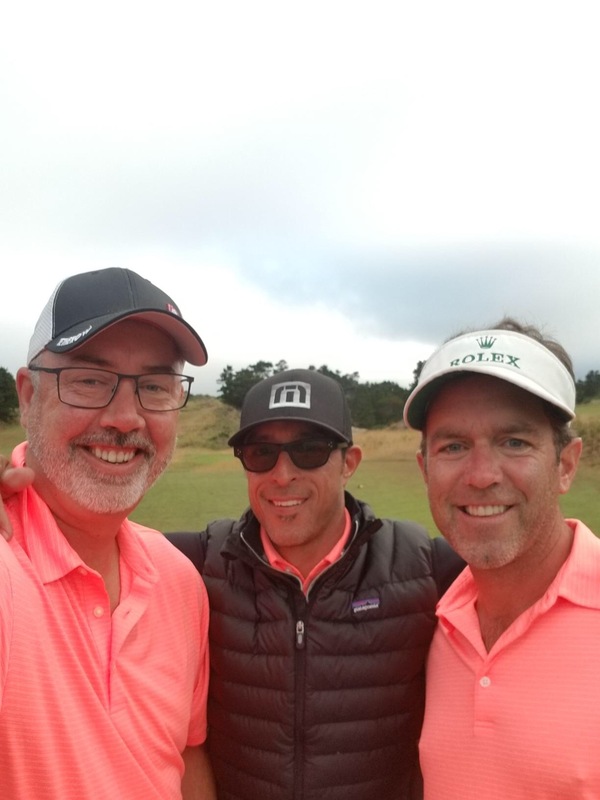 Clad in virtually glow-in-the-dark coral Walter Hagen shirts, the Seattleites extended their lead in Saturday morning bestball medal at Pacific Dunes. Seattle won matches 3 through 5 after halving the first two: only Cox and Austin Teague won their match for the Worlds. 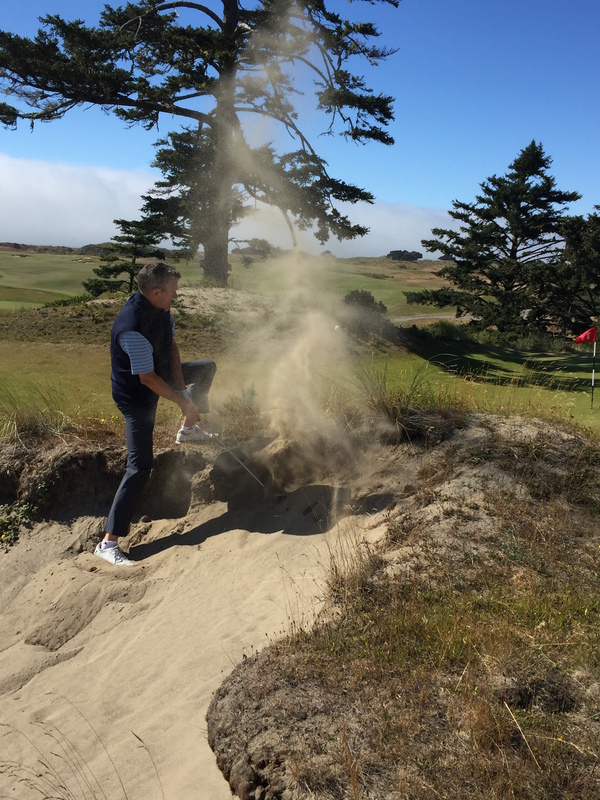 The fog rolled in at Bandon Dunes in the afternoon and that seemed to slow the onslaught, as the Worlds won the afternoon tiebreaker stanza 3 1/2 — 2 1/2 to make the score 15 1/2 — 8 1/2 heading to singles at Bandon Crossings. 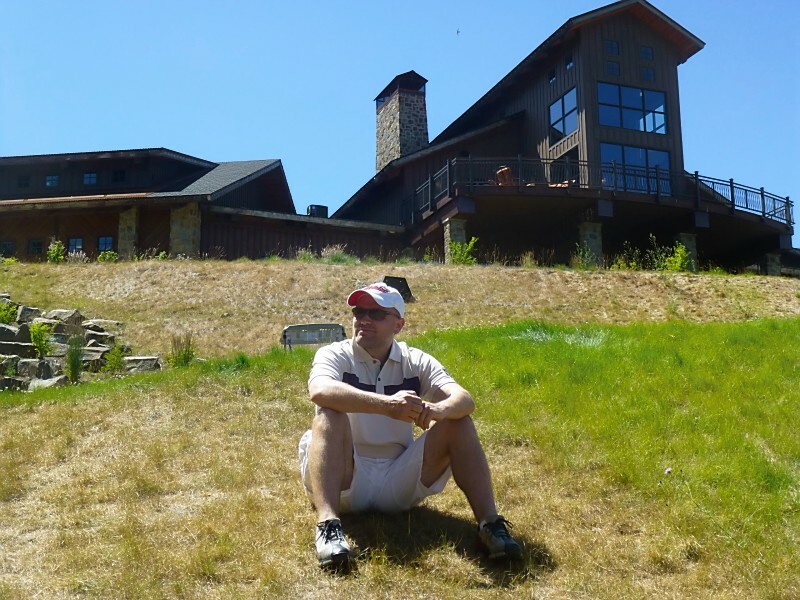 Teague, shown here at Pacific Dunes, teamed with O’Brien to snap Jenkins’s three-year personal winning streak at ten. Seattle needed only three points heading into singles — and it won them quickly. Aro clinched the Cup on the twelfth hole of the third match of the day with a convincing 7&6 win over rookie Reuben Mickel. After that the only question for the players who hung out for the duration was whether Seattle could beat its record of 24 points, a standard it set in 2015 and which was once thought as insurmountable as Joe DiMaggio’s 56-game hitting streak. Waldner was the only player to break 80 in all rounds at Bandon. Team 206 didn’t quite hit the twenty-four point mark, but an eleven-point win made Cox’s putt in Victoria last year a very distant memory. 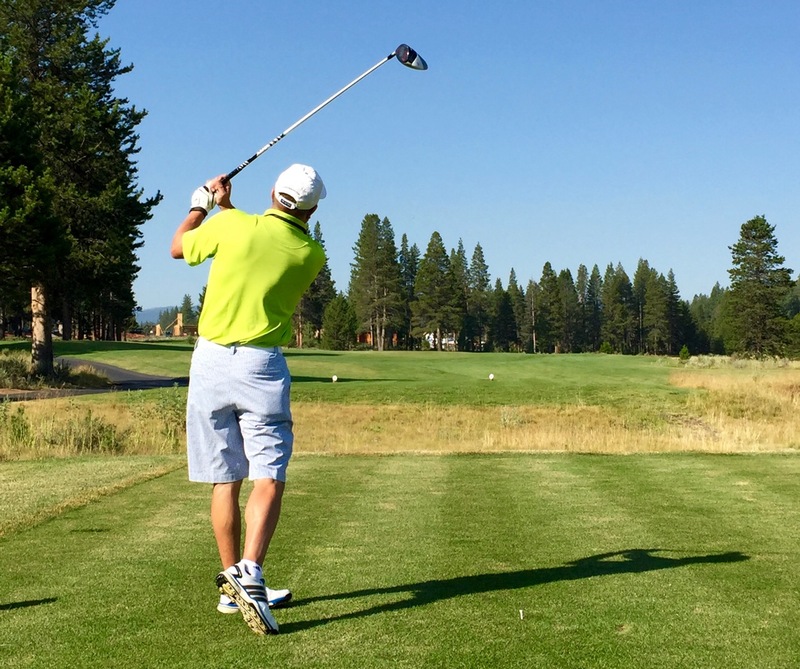 Greenspan Cup XXII is tentatively scheduled for Whitefish, Montana. Cheever and Jenkins are expected back as captains. This entry was posted in Recaps on July 29, 2018 by greenlakenick. Victoria, British Columbia. At 2:30 pm on Sunday, Steve Cox was winless, nervous, and wondering if he’d make the long flight home to Los Angeles as a member of the losing squad for the second straight year. Fifteen minutes later, he was a Greenspan Cup hero. The second-year World Team veteran hit a ten-foot downhill putt in the final group and on the final green to defeat Mike Waldner 2 up and deliver the World Team a 15 1/2 — 14 1/2 victory in the twentieth playing of the Greenspan Cup. Bear Mountain’s par five 13th was not as great as we remembered it from 2005. It was not always evident that a close match was in the cards. The Seattle Team picked up where it left off in 2016 with a 4-1 win in Friday morning fourball. Two of the matches — Jeff Benezra and Nick Jenkins’s 5&4 win over Cox and Joe Stansell and Vince Deandre and Peter Fessler’s 6&5 win over Paul Sharkey and Adam Waalkes — weren’t close. And it wasn’t because the 206’s played particularly well. Seattle captain Jenkins went 5-0 for the second-place squad. Seattle fought back in the Saturday morning fourball medal matches. Jenkins and John Harrison put Sharkey back in his place – the L column — with a 70-75 win, and Deandre and rookie Isaac McLellan squeaked out a narrow 72-73 win over Stansell and Greg Cheever. But the Worlds took the afternoon again at Gorge Vale to tie the matches at 10 going into singles. Among the winners: Brad Nelson, who shot his second straight 79 to, with teammate Cheever, beat Benezra and Mike Waldner 5&4. And what a Sunday it was. Three of the ten matches were barely matches at all. Teague was forced to retire against Harrison with health issues, and two World Team members, Waalkes and Sharkey, beat their opponents (Jack Laidlaw and Isaac McLellan, respectively) by 8&7 scores. “After watching Sharkey imitate Charles Barkley on Saturday, I would have bet Clinton money that he would not win a match 8&7,” said a shocked Jenkins. The rest of the matches were relatively close, but most of the closes ones broke the World Team’s way. Rookie Karl Stricker beat Steve Whitaker, back from a ten-year hiatus, by a 2 up score. Tim O’Brien beat Benezra 1 up when the latter missed a four-foot putt to tie on the final hole. Then there was Cox v. Waldner. The second-year World Teamer had struggled all week off the tee and was 0-4 coming in. “Given how sideways Cox was driving the ball, I liked Waldner’s chances coming in,” said Jenkins, who played against Cox three times in the first four matches. But on this day Cox’s banana ball slice was slightly less fruity, and he put together his best round of the weekend. Waldner trailed only 1 down standing on the 18th tee but, given that Cox stroked, the one-time Division I player needed to win the hole by two strokes. He had a five footer left for par as Cox stood over his ten footer for bogey. Cox’s winning putt might still be going had it not hit the hole. It was almost Waldner’s moment. But Cox ceased it — and his place in Greenspan history — instead. Planning for Greenspan Cup XXI is already under way. 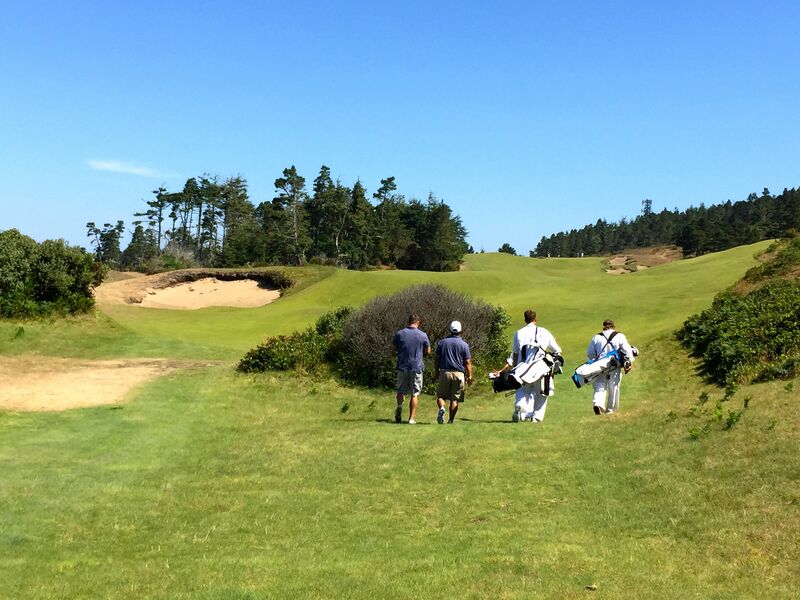 We’ll head back to Bandon Dunes. The captain and his favorite player. This entry was posted in Recaps, Uncategorized on July 7, 2017 by greenlakenick. 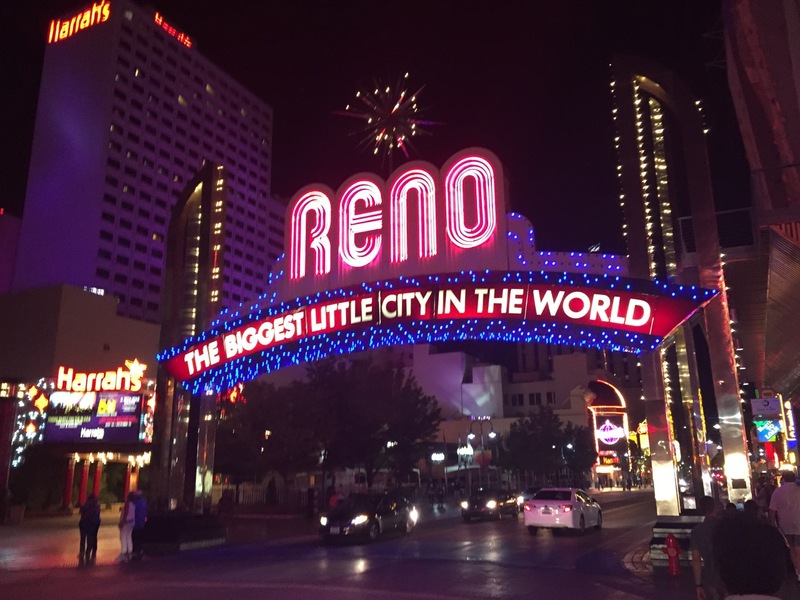 RENO-TAHOE. Tony Secretario and Peter Fessler each went 5-0 and Max Anderson, Nick Jenkins and newcomer Frank Mccaslin all went 4-1 as the Seattle Team cruised to a four-point win in the nineteenth playing of the Greenspan Cup. Joe Stansill added 3 1/2 points for the World Team, which lost for the third time in four years after winning five in a row from 2008-12. With three points each, Blake Mori, Norman Cheuk and Adam Waalkes were the only other World Team players with winning records. As with most Greenspans, the result of this outing was hardly a fait accompli. The World Team jumped out to a 4-2 lead in Friday morning’s fourball matches; three of its wins came before the sixteenth tee. 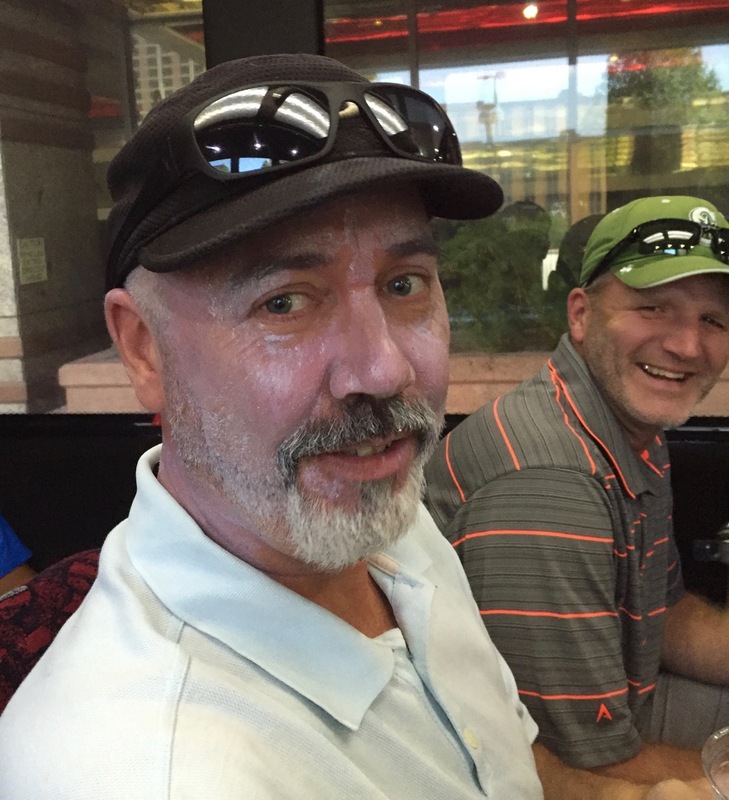 Captain Sharkey’s squad held serve in the afternoon Aggregate Stableford matches, and but for Peter Fessler’s last hole birdie to beat Cheuk and Steve Cox by a 60-59 tally, the Seattle Team’s overnight deficit would have been worse than two. But the undefeated Seattle Team veteran did make birdie, and that set the tone for a big Seattle Saturday. Team 206 won 4 ½ of the six points available in the morning Bestball Medal round at Coyote Moon (only Cheuk and Tim O’Brien won) and what was a two-point World Team lead was suddenly a one-point deficit – ironically, the same score as it was going into Saturday afternoon last year. Norman Cheuk, shown here on the 14th hole at Coyote Moon, was one of the few bright spots for the World Team. Saturday afternoon went no better for the Worlds. Seattle won the Bestball Tiebreaker stanza by a 4-2 count, its only losses coming by Jack Laidlaw, who played Stansell/Cheever on his own; and by Simon Spratley and Mike Waldner, who withdrew in their match against Brad Nelson and Steve Cox when Waldner was stung by a bevy of wasps and pulled his calf trying to get away. “I didn’t know Waldner had those kind of moves,” quipped Nelson, who beat Spratley for the second time in two days. The most memorable match of Saturday afternoon was Anderson/Jenkins v. Cheuk and newcomer Bob Thomas. The latter rallied from a four-hole deficit with four to play to take the match to the final hole and would have eaked out a halve had Thomas not left a twenty-foot putt an inch short on their final green. The World Team entered Sunday with a three-point deficit – the same as 2015. The team played better than it did last year – 1 ½ total points is easy to beat – but a 6 1/2 – 5 1/2 World loss in singles still added up to a 20-16 Seattle win. The biggest surprises: the until-then 0-4 Spratley’s 6&4 win over Stefan Gran and the injured Waldner’s halve with Thomas. Those weren’t the kind of surprises the World Team was looking for. If XIX had a sub-theme, it was injuries. Seattle’s. Longtime 206 vet Chris White couldn’t make the trip due to a serious degenerative back condition. 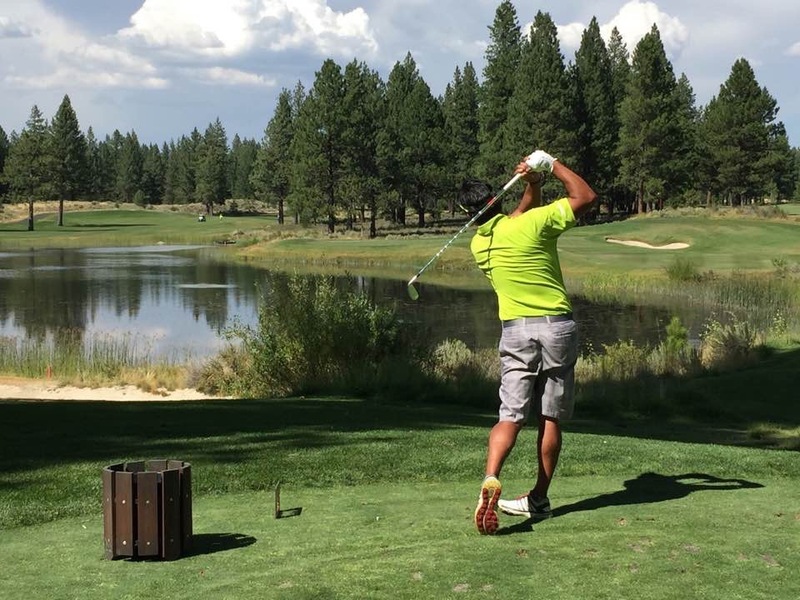 Fellow vet Joel Aro made it to the Biggest Little City in the World but could manage only four holes in the practice round before packing it in for the weekend. And Waldner withdrew on Saturday afternoon after his aforementioned losing battle with a wasp’s nest and played Sunday on one leg. But the injuries made no difference. Despite effectively ceding two points to the Worlds – the aforementioned Spratley/Waldner WD and Aro’s DNP singles “loss” – and playing four other matches 2 v 1, Seattle still won by four. Seattle vet Joel Aro, shown here on the way to Thursday’s practice round, could not make the call due to a bad back. When the discussion turns to how bad the losses are, it can only bad news for one team. And as of now, that team is the World. Next year’s Cup, the twentieth, is scheduled for July 2017. The likely site: Victoria, British Columbia. Jenkins will captain the Seattle squad, while Cheever will return as captain for the Worlds. This entry was posted in Recaps on July 31, 2016 by greenlakenick. There are certain numbers that are synonymous with unbreakable records in sports. 56 — Joe DiMaggio’s hitting streak in 1941. 100 — Wilt Chamberlain’s points in a single 1962 NBA game. 11 — Byron Nelson’s consecutive tournament wins in 1945. Add 24 to that list. That’s the number of points the Seattle Team scored in defeating the World Team at Greenspan Cup XVIII in Bandon, Oregon. Competitors played the practice round on the 13-hole Preserve course. 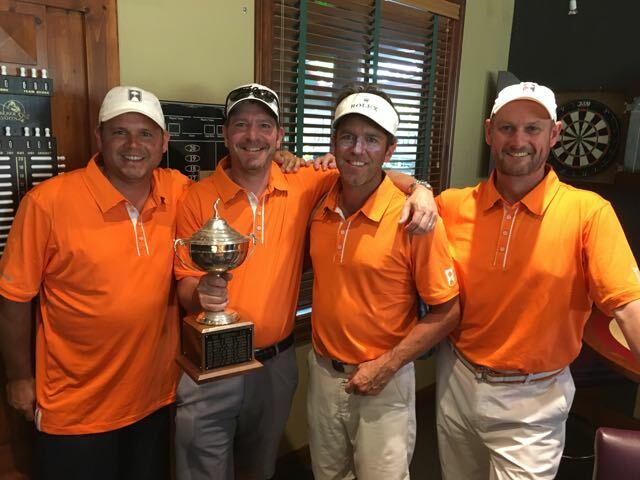 Team 206’s 24-12 win was 1 1/2 points better that its 22 1/2 — 13 1/2 win in Greenspan Cup IV, a competition record which stood for fourteen years. It was also 8 1/2 points more than it scored just a year earlier at Greenspan Cup XVII. Mike Waldner led the Seattleites with a 4-1 record, while Max Anderson, Vince Deandre, Peter Fessler, Captain John Harrison, Nick Jenkins, Pat Scoccolo and Tony Secretario all went 3-1-1 for the winners. Leo Madden went 3-1-1 and newcomer Blake Mori went 3-2 for the World Team, which lost for only the second time in eight Greenspans. The new Punchbowl putting course played host to Thursday night debachery. 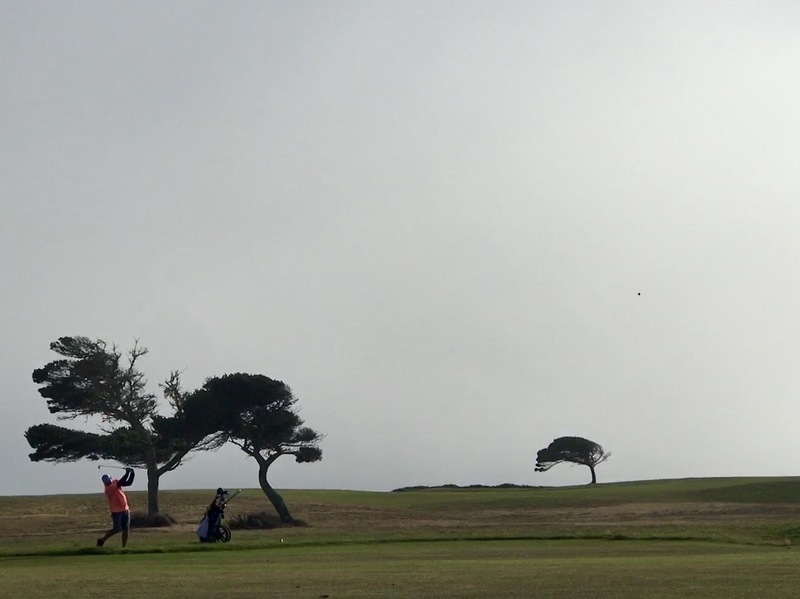 Stephan Gran and Blake Mori had a key comeback win at Bandon Trails. Despite the final tally the outcome was hardly a fait accompli. Seattle jumped to a 4-2 lead after Friday morning fourball, winning four matches and tying two more. 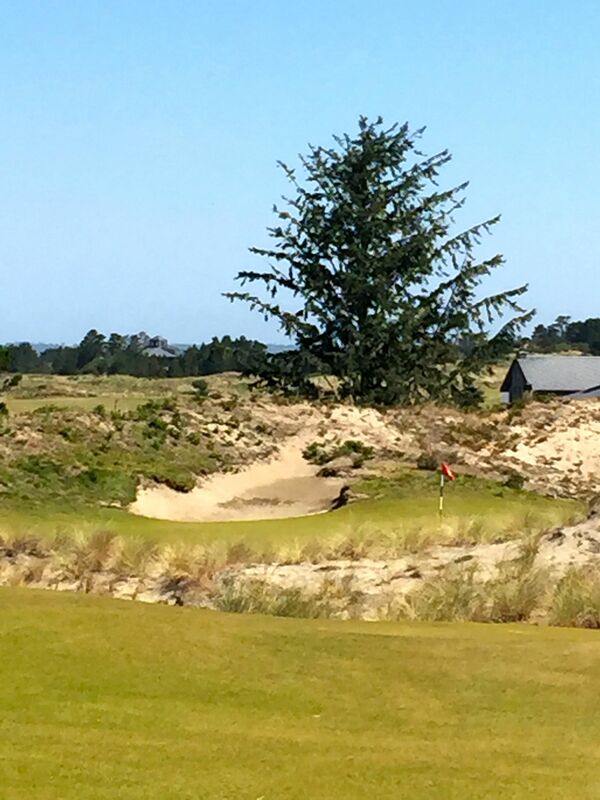 But the World Team hung tough in the afternoon Stableford at Pacific Dunes. With Seattle up 7-3 and threatening to pull away, the teams of Cheuk/Mori and Nelson/Madden each won their closing matches handily to make the score 7-5 heading into Saturday. 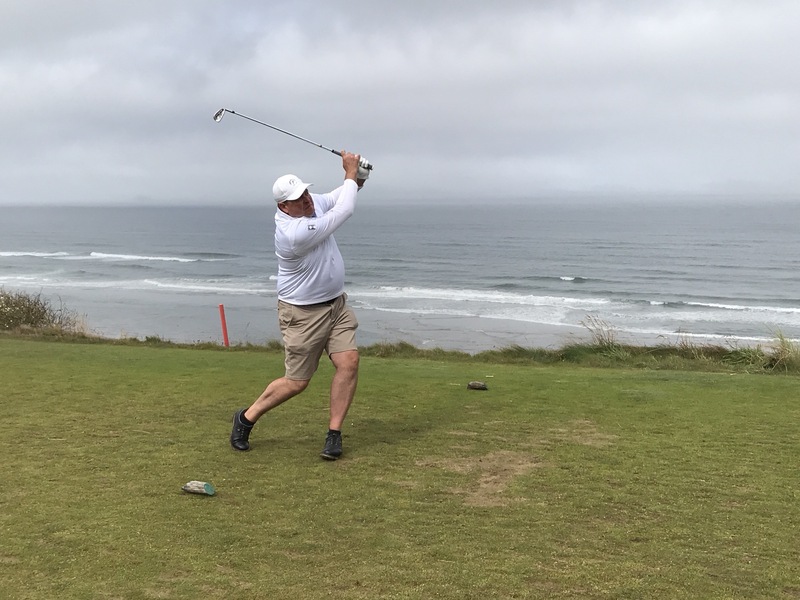 Newcomer Charles Birnbach, shown here at Pacific Dunes, had a hole in one during the practice round. Captain Paul Sharkey’s World squad narrowed the gap on Saturday morning. The Worlds took 3 1/2 points in the morning fourball medal at Bandon Dunes to cut the lead to one. But it was all downhill from there. With their injured colleague Joel Aro watching on course, the Seattle boys took four of six points in the afternoon fourball tiebreaker at Old MacDonald to extend their lead to three going into Sunday singles. Returning veteran Paul Ahern was one of ten Seattleites to win his singles match. A three-point lead is usually not insurmountable going into singles. But this time it was. Team 206 won the first nine matches at Bandon Crossings — certainly a record if there was such a stat — and the outcome of the competition was decided when Deandre beat John Sheehan 1 up in the fifth match of the day. Only Sharkey, who defeated Simon Spratley, and Joe Stansell, who halved Harrison, put anything on the board for the World Team. Nick Jenkins, the losing captain last year, posed with the hardware after the rain came on Sunday afternoon. Greenspan Cup XIX is tentatively scheduled for the last weekend in July 2016. Captains Harrison and Sharkey are expected to return. This entry was posted in Recaps on August 2, 2015 by greenlakenick. University Place, WA — A decade ago, Adam Waalkes was the opponent every Seattle Team member wanted to face. Today, no 206er wants any part of him. The seventeen-year Greenspan Cup veteran went 3-1-1 to help the World Team reclaim the Cup 20 1/2 — 15 1/2 at Chambers Bay. (Share site I Pics.) Long-feared Leo Madden went 4-1 for the winners, who won the annual competition for the sixth time in seven years. Michael Richardson and Jon Gaston also went 3-1-1 for the Worlds, while newcomer Eric Ward went 4-1 for the Emerald City boys. Adam Waalkes (shown here at the Chambers Bay practice round) was one of three World Team players to win at least 3 1/2 points. Early on it appeared not even Sir Pop-a-Lot would be enough for the Worlds to reclaim the Cup, which has resided in Nick Jenkins’s family room for the last year. 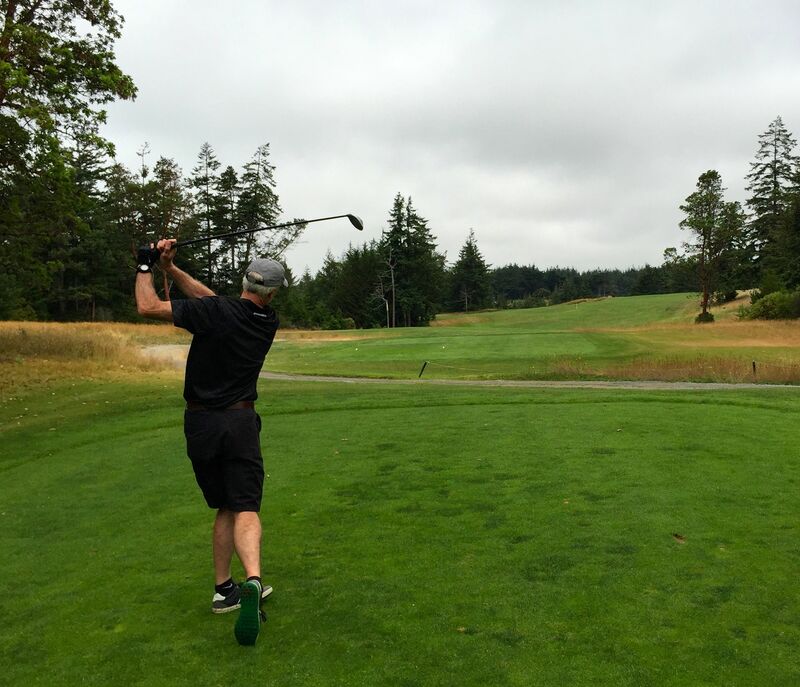 The teams of Max Anderson/Eric Ward and John Harrison/Chris White both won their matches on the 14th hole at Gold Mountain’s Olympic Course and the Seattle Team led by a point after the Friday morning bestball matches. 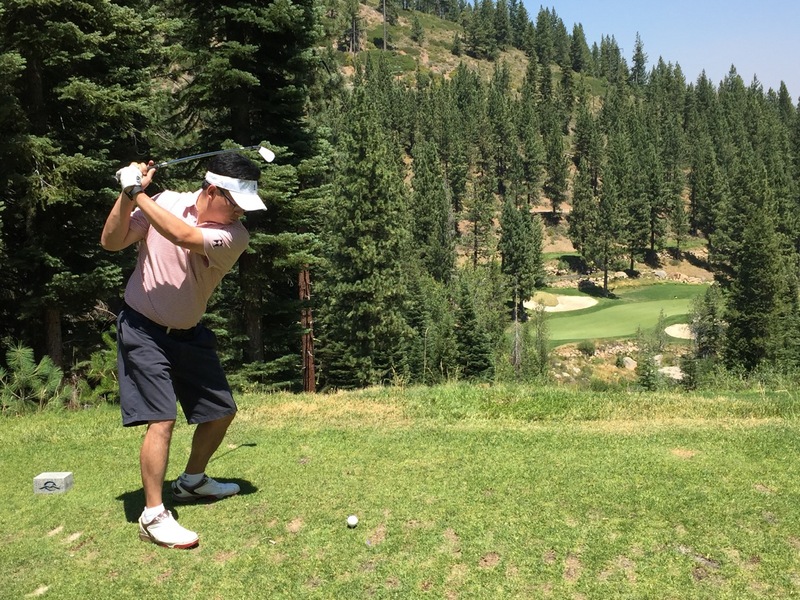 But the lead was short lived as the World Team won four points in the afternoon Stableford at Gold Mountain’s Cascade Course. It could have been worse: World Team Captain Paul Sharkey and Tim O’Brien both missed two footers on the 18th hole to hand their match to Peter Fessler and Jenkins, 71-70. “I have a Doug Sanders history with Jenkins on 18th holes,” lamented O’Brien who, in 2011, missed a one-foot putt on Bandon Dunes’ final hole that handed this year’s Seattle captain and Joel Aro a half point in a match they should have lost. O’Brien bounced back the next morning, however, as the Worlds extended their lead to three heading back to Chambers Bay. Four World teams — John Sheehan/Joe Stansell, Jason Matzat/Waalkes, O’Brien/Richardson and Madden/Brad Nelson — shot 65’s or better to extend the World Team’s lead to three. 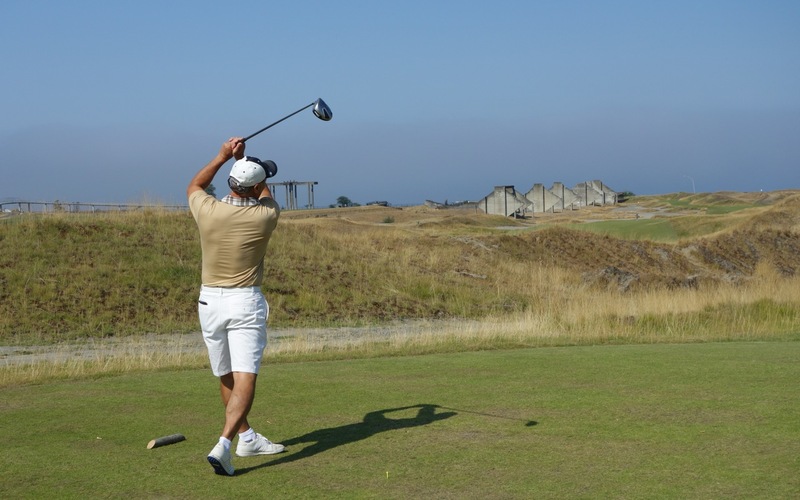 Seattle bounced back in the Saturday afternoon fourball tiebreaker matches at Chambers Bay, however, to narrow the deficit to two heading into Sunday singles. Because the World Team won the practice round tiebreaker, however, the Seattle Team needed to win 7 1/2 of twelve points in Sunday singles to retain the Cup. Only Baron Kofoed and Ward won their singles matches for the Seattle boys, and thanks to 2 1/2 points from a record five halved matches, the World Team cruised to a five-point victory. Baron Kofoed was one of only two Seattle Teamers to win their singles matches. Better play would help, but so would accurate handicaps. Captains Sharkey and Jenkins elected to go with the July 15 GHIN cycle instead of the updated July 30 one, mostly because the GHIN update wasn’t scheduled to happen until a few hours before the Friday morning round. That decision may have made a difference. Jenkins’s handicap, for example, went up .7 strokes, while Waalkes’ went down 1.2 strokes. 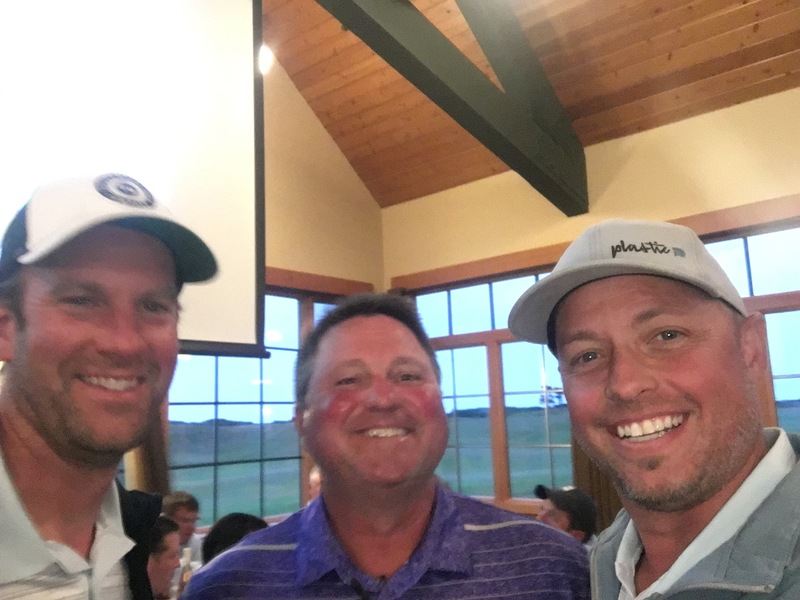 Waalkes and O’Brien beat Jenkins and Tony Secretario 3&1 — six hours after GHIN posted its July 30 GHIN cycle. Team 206 won’t have to wait as long as the Worlds did for its chance to take back the Cup. 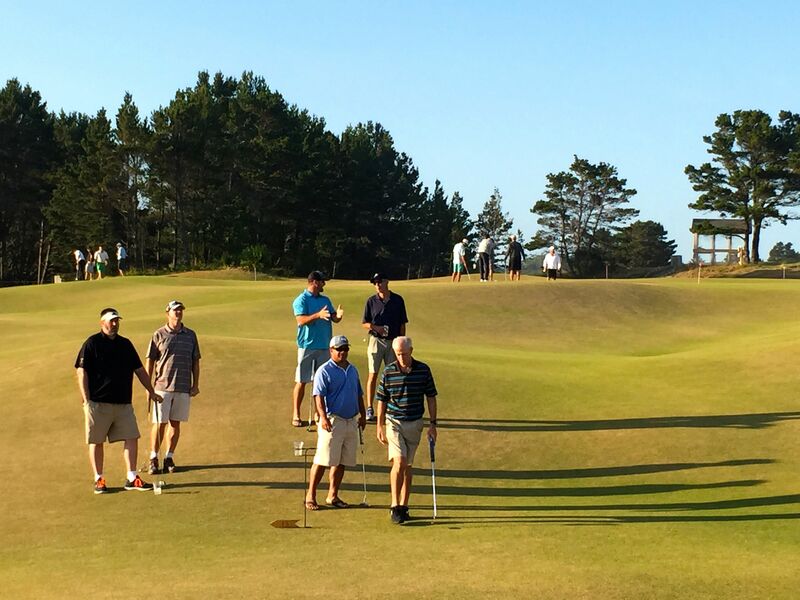 Whereas there was a fourteen-month gap between Greenspan Cup XVI at Pinehurst and this year’s competition, Greenspan Cup XVIII is already booked for July 30-August 2 at Bandon Dunes, Oregon — less than a year away. Sharkey and Jenkins will likely return as captains. This entry was posted in Recaps on August 4, 2014 by greenlakenick. 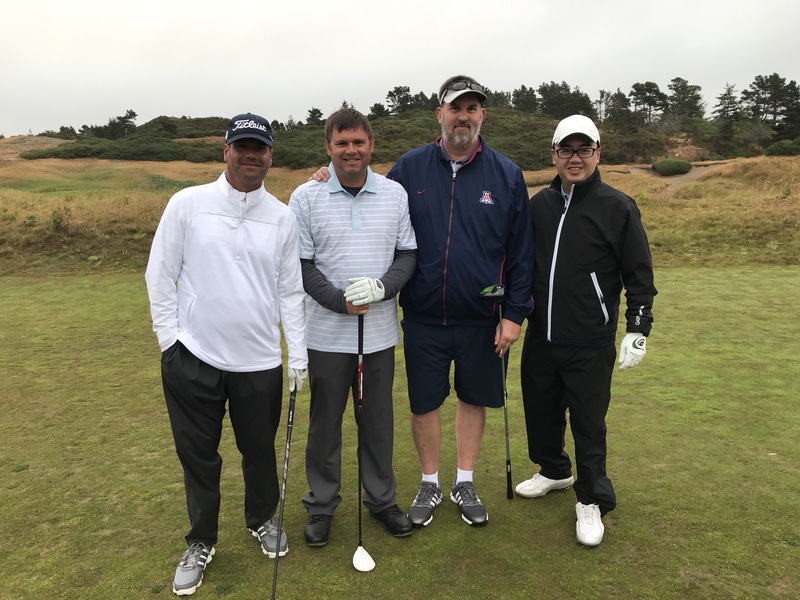 Pinehurst, NC — John Harrison, Nick Jenkins and Tony Secretario all went 4-0 and Baron Kofoed went 3-0-1 as the Seattle Team routed the World Team 21 1/2 — 13 1/2 in the sixteenth playing of the Greenspan Cup. Newcomers Rich Crutchfield and Michael Richardson went 4-0 and 3-0-1 for the World Team, which saw its six-year winning streak ended. Friday’s weather busted more than a few umbrellas. For a while it looked like both teams might lose these matches — to the weather. 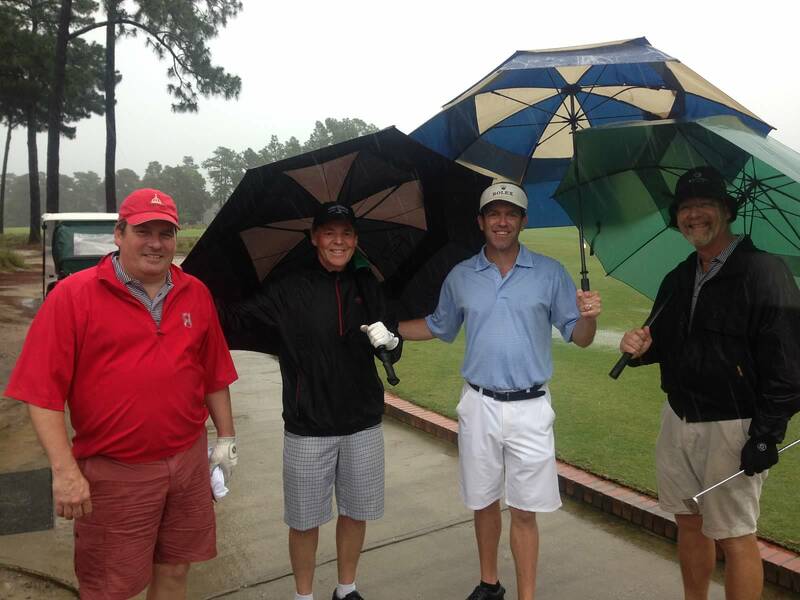 Players played the Friday morning fourball tiebreaker match on the famed No. 2 course in a tropical storm. Two hours into said deluge the course on which Payne Stewart won the 1999 U.S. Open was so saturated that putting was all but impossible; a full swing with a putter would stop dead in the soaked greens. Three of the seven matches were conceded because of the rain, which came down so hard at some points that it seemed to be coming out of the ground. What a five-point lead on Saturday night looks like. The rain didn’t stop, and the captains cancelled the afternoon matches with Seattle leading 4 1/2 — 2 1/2. The weather improved considerably on Saturday, but the World Team’s fortune did not. 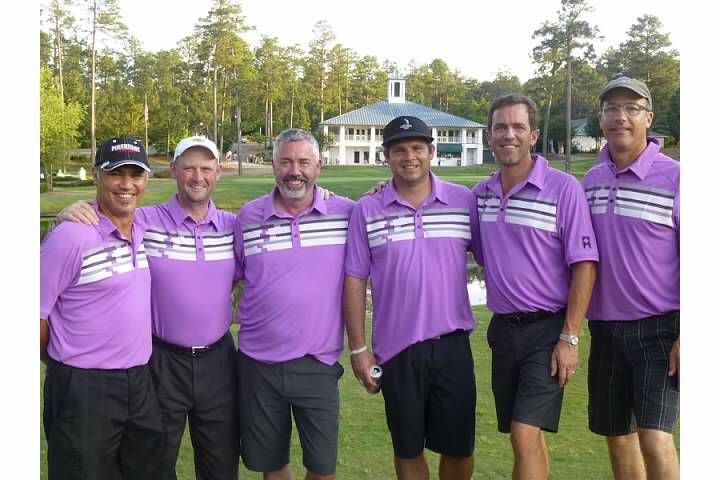 Team 206 won five of the seven morning fourball matches on the No. 4 course, with only the rookie team of Richardson/Crutchfield and Jason Matzat/Adam Waalkes winning their matches. The teams split the afternoon fourball matches on the No. 7 course, with a remarkable three of the seven matches ending in halves. Down five points, the World Team needed a miracle in Sunday singles to extend its streak. No sir. The Seattle Team won 3 1/2 of the first four points and for a while it looked like the the largest margin of victory ever record — nine points in 2003 — might be in jeopardy. It didn’t work out that way, but the eight-point win made this the second most lopsided Greenspan ever. 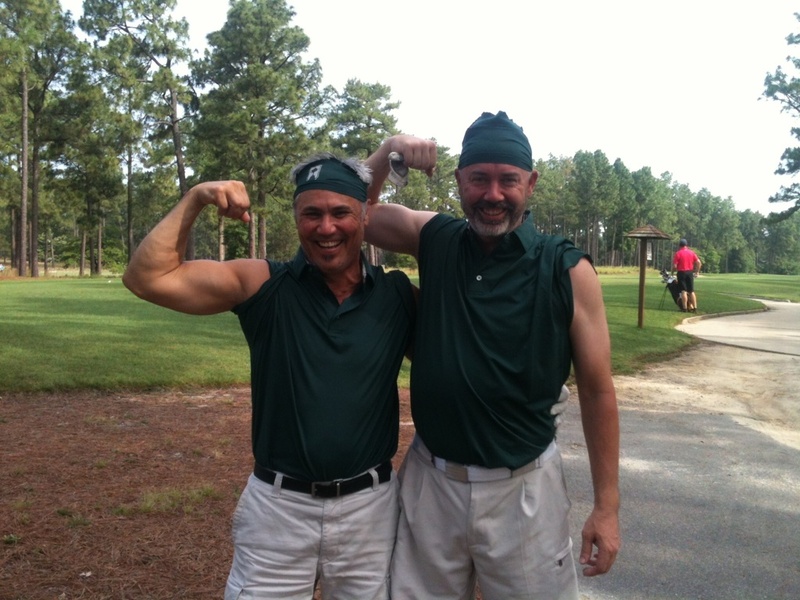 Aro turned his Sunday shirt sleeves into headbands for himself and playing partner Kofoed. After the event theretofore undefeated World Team Captain Paul Sharkey was left to wonder what happened. He didn’t need to look far. The World Team’s veteran core — Sharkey himself, Greg Cheever, Jon Gaston, Brad Nelson, Tim O’Brien, Brian Patton, Rob Stonesifer and Adam Waalkes — went a combined 4-21-7. But for the performances of rookies Crutchfield and Richardson, who went 7-0-1, the Seattle team might have won on Saturday night. Greenspan Cup XVII is scheduled for late July 2014. A site has not been determined, but the teams will likely stay a bit closer to home. This entry was posted in Recaps on June 22, 2013 by greenlakenick. 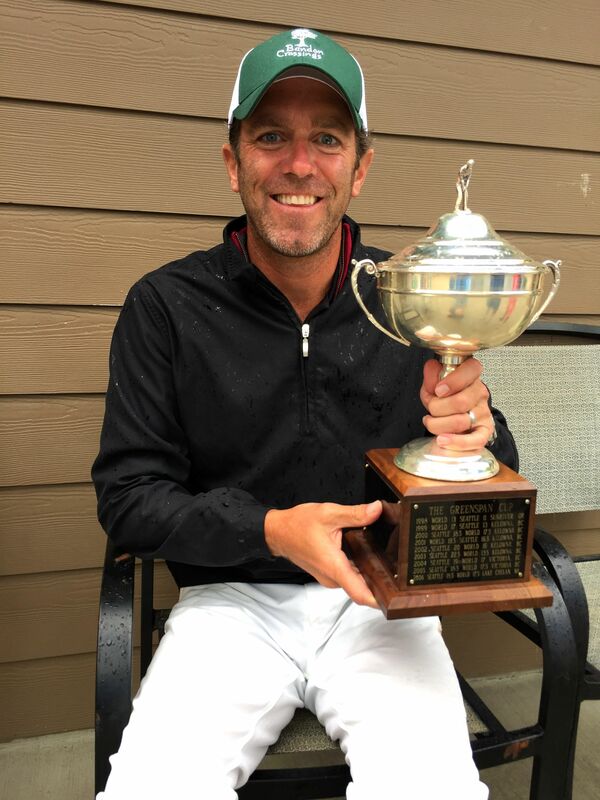 Three years ago, Brian Patten sported an under-the-speed-limit swing speed and was lucky to eke out a 1 up singles win over Mike Waldner, his only point of Greenspan Cup XI. This year, he went 5-0 and was the star player on a World Team that has now won five Greenspan Cups in a row. Patten’s teammate Chris Hansen also went 5-0 while newcomer Joe Stansell went 4-1 for the winning team. Tony Secretario and John Harrison went 4-1 for the Seattle Team, which hasn’t won since a year before Barack Obama was elected president. At 4-0, that he does. The matches started off close on Friday morning. The World Team won the morning fourball match stanza 3 ½ – 2 1/2, with all six matches reaching at least the 16th hole. 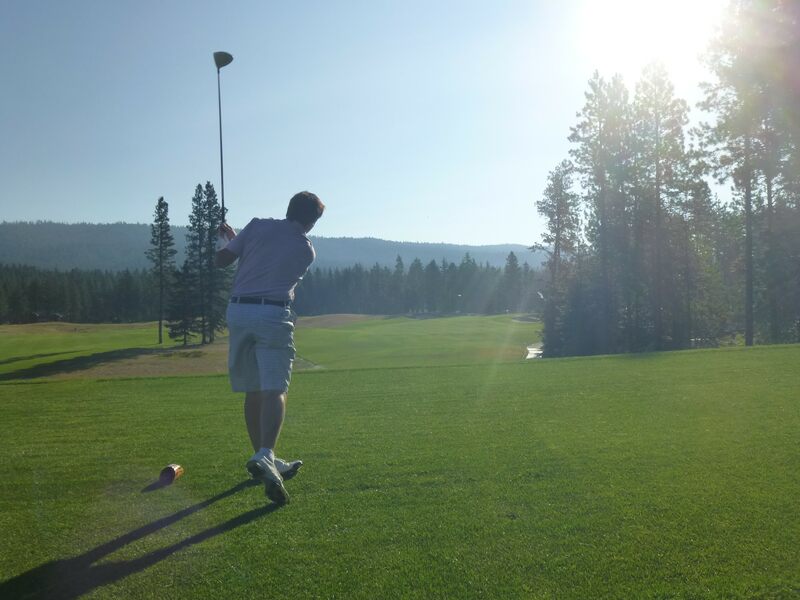 But the Seattle Team fought back to even the score at 6-6 after Stableford. 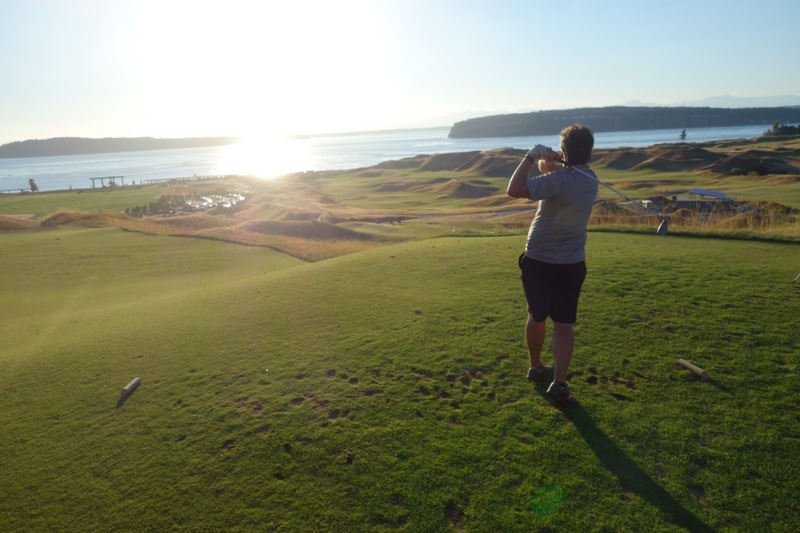 Longtime Seattle captain Nick Jenkins and rookie Baron Kofoed rallied to beat Ben Smith and Norman Cheuk 56-54 with the sun setting, a win Jenkins later called his most satisfying of the decade. But Saturday morning belonged to the World Team. Three of the Seattle Team’s six fourball medal teams could manage no better than bestball 76’s (ouch! ): the World Team won all three of those matches on its way to a 4-2 stanza win. But the Seattleites fought back in afternoon fourball tiebreaker. After the Seattle team briefly fell behind 13-9, the teams of Secretario/Chris White and Harrison/Steve Whitaker rallied to win close matches at day’s end to make the score 13-11. But Seattle could not close the gap in Sunday singles. and Brian Patten each went 5-0 for the World Team. Stansell used an uber-long 4 iron tee ball to wallop Jeff Benezra 7&5, while Patten beat Paul Ahern 7&6 to cap his perfect Cup. Joel Aro got stuck in a greenside bunker on 18 to lose his match to Adam Waalkes 2 down to give the World Team a guaranteed 18 points. And when Hansen closed out Max Anderson 2&1, the Cup was the World’s. He was being facetious, of course. But for now the World’s dominance is clear. If the World Team wins next year it will tie the Seattle Team’s record of six Cups in a row, a record Jenkins, among others, once thought insurmountable. Greenspan Cup XVI is scheduled for the summer of 2013. Sharkey will return as the World Team’s captain, while Benezra will captain the Seattle Team for the first time. 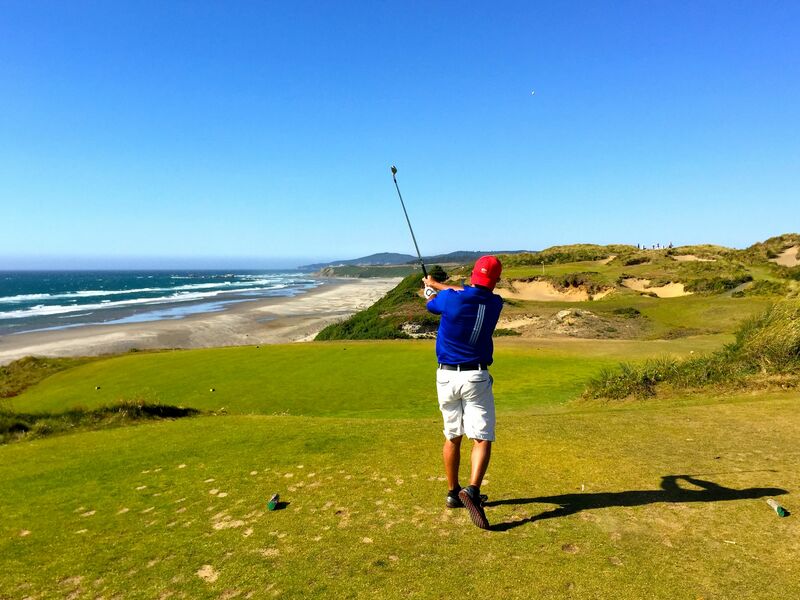 Bandon Dunes is the likely destination. This entry was posted in Recaps on August 6, 2012 by greenlakenick.